The following is the text of Mike Bloomberg’s speech as prepared on Monday June 26th, 2017. “Thank you Manny, and good afternoon, everyone! We’re lucky to have Manny as a Board Member at Bloomberg Philanthropies, and I want to thank him and Miami Beach Mayor Phil Levine for welcoming us here. “I also want to thank Oklahoma City Mayor Mick Cornett, the outgoing president of the Conference of Mayors, and New Orleans Mayor Mitch Landrieu, the incoming president, for inviting me. Both have done terrific jobs in their cities, and Mitch has been a great partner for our foundation on many different issues. He’s never been afraid to take on tough issues, whether it’s education reform or the removal of the Confederate monuments. “When I was first elected, I remember people telling me, ‘You shouldn’t address problems that are politically controversial, because it will only hurt your popularity.’ I found the reverse to be true. The more we took on those kinds of issues, the more voters respected and supported us, even if they didn’t agree with us. That’s how a non-Democrat could win three successive elections in a city that’s 5-to-1 Democratic. “I believe that all across the country, voters are looking for leadership, and for elected officials who aren’t afraid to say what they think and to do what others say can’t be done. Mayors do that better than any other group. “As we all know, being a mayor is the toughest job in politics. Like all executive offices, it’s a management job, not a policy job. But unlike being a governor or even president, people hold you accountable for what happens in their communities. “But from my experience, serving as a mayor is the most exciting and rewarding job in the world. Every day, each of you wakes up with the chance to make a real difference in people’s lives. That is a great privilege, and a great responsibility. But all of you know that already. “So today, I’d like to talk with you about another aspect of your job that doesn’t get much attention: the central role that cities will play in determining our nation’s future as a global superpower. “Let’s start with a basic fact. We are in the middle of a political era defined by partisan paralysis, and nowhere is it worse than in Washington. Compared to any other era in modern American politics, our nation’s capital has been unable to address the great challenges we face. “The causes are many: gridlock, extremism, partisan media, fear of special interest groups. But the result is same: On nearly all the big issues, Washington has been AWOL, and as further budget cuts loom, the situation is going from bad to worse. “But here’s the good news: As Washington has grown more dysfunctional, cities have grown more dynamic, and mayors have grown more powerful and important. Pick an issue, any issue, and mayors in both parties are leading where Washington won’t. And mayors are working across the aisle in ways that Washington wouldn’t dare. “The result is that, to the extent we are making any progress as a nation, cities are driving it – from taking on education reform and public health crises to spurring economic development and job growth to battling crime and climate change. That work has helped revive cities and made them a magnet for many of the most talented and hardest-working Americans. “But as cities grow, the longer that Washington ignores major threats like our crumbling infrastructure and emerging challenges like the automation of jobs, the more dangerous those threats become. The question we face is: How do we accelerate cities’ progress to make up for Washington’s inaction? “The answers lie with all of you. And as the dysfunction in Washington has grown even worse, the need for bold city leadership has grown more urgent. “Now, I know what you may be thinking. Ronald Reagan once said, ‘The nine most terrifying words in the English language are, “I’m from the government, and I’m here to help.”’ Having dealt with Washington regulations, I have to say, he had a point. “But in all seriousness, I’ve been in your shoes. I know what it’s like to deal with tight budgets and problems that are decades old. I could’ve used more outside help, and now I’m determined to do what I can to help provide it to all of you. You are the ones who will do all the hard work. The buck stops with you. But there are things we can do to support you and help you find and implement new solutions. 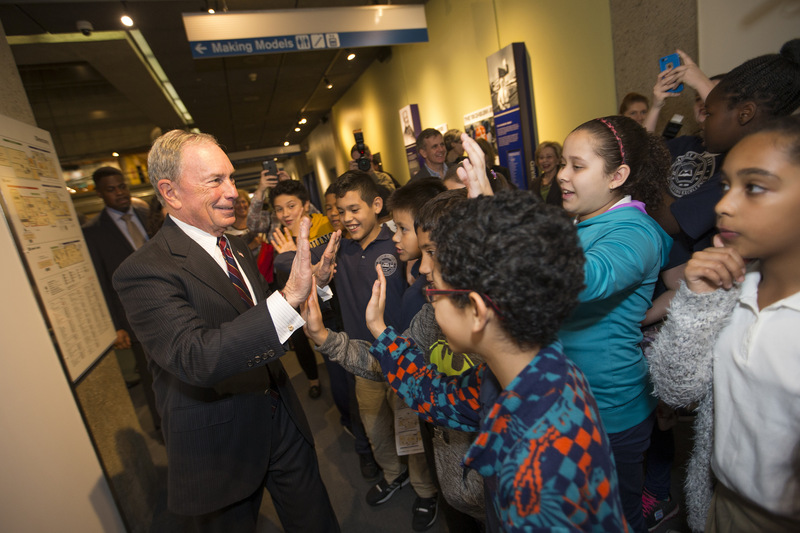 “To do that, today, we are launching a major expansion of Bloomberg Philanthropies’ work in U.S. cities, on all five of the main issues we focus on: government innovation, education, the arts, the environment, and public health. “And we are calling our work in U.S. cities the American Cities Initiative. With a budget of $200 million, this is the largest-ever philanthropic investment in helping mayors run their cities. “Now, Bloomberg Philanthropies also does a great deal of work internationally, from improving road safety to preventing drowning. And here at home, not all of our work involves cities– but a lot does, because compared to Washington, America’s cities are more nimble, more pragmatic, more responsive to public concerns, more open to experimentation, and, about two of three Americans live in cities. “All of those factors make cities ideal change agents. And by strengthening them, we can strengthen America, no matter which way the winds in Washington may shift. Through the American Cities Initiative, we will invest $200 million in a wide variety of programs, all of them centered around three primary goals. “First, we want to strengthen cities halls and equip more mayors to solve their most important problems. We’ll do this by providing money – by rewarding innovative ideas with prize money. We’ll do that by providing technical assistance – by helping more mayors use data to improve lives. And we’ll do that by providing in-depth consulting services and leadership development – by connecting more mayors to our team of experts. “Second, we want to help advance important policies and legislation, particularly with respect to education, climate change, and public health. In some cases, that will take the form of policy support, like the work we’re doing to help mayors improve the energy efficiency of their buildings. 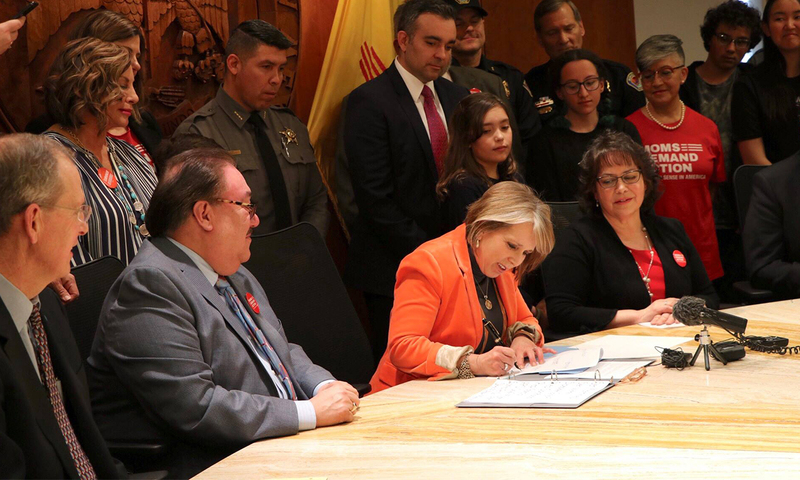 “In other cases, it will take the form of advocacy, including in state capitols, some of which have been defunding cities and eliminating local authority over a variety of issues, such as gun violence and clean energy. At a time when America needs bold city leadership more than ever, we can’t afford to let states tie the hands of mayors behind their back. “Our third goal is empowering citizens – including entrepreneurs, artists, and volunteers – to become part of this work. We’ll do that through programs that help cities capitalize on volunteers, leverage the power of public art, and form more public-private partnerships. “By tapping into the minds and muscles of citizens, their resources and relationships, cities can strengthen communities and create a greater sense of ownership and investment. Across all of this work, we’ll convene and connect mayors, so that the best practices and most effective policies spread far and wide. “Today, we’re kicking off this American Cities Initiative by officially opening the 2017 Mayors Challenge. This is the fourth Mayors Challenge, and our biggest. For those who aren’t familiar with it, I’ll quickly explain. “The Mayors Challenge invites cities to propose bold new ideas for tackling big problems. We then select the best ideas, help cities refine them, and give the five most promising proposals funding to implement them. After a very successful first competition here in the U.S., we took the Mayors Challenge to Europe, and last year, to Latin America and the Caribbean. “Some of our past winners have included Providence, Rhode Island, which pioneered a new approach to early childhood education that’s helping parents use more words with their children – and it has experts in the field very excited. Chicago has created a Smart Data platform that is anticipating problems, allowing the city to address them before they happen. Warsaw, Poland created a navigation system for the visually impaired. Santiago, Chile has just begun attacking their childhood obesity epidemic. And Athens, Greece developed a program to enlist citizens in the work of improving their communities. To give you one example of how that’s working, the vast majority of graffiti has been removed from some areas of Athens. “This year, we’re bringing the challenge back home to the U.S., where it began – and expanding it, because the need for strong city leadership has never been greater. Here’s how it will work. “We’re inviting every city with at least 30,000 residents to apply. That includes every city whose mayor is here today. On your table there is an invitation with a card in it that you can fill out, and our staff will be collecting responses as you leave today. The first 300 cities to register will receive guidance from experts on how to develop a breakthrough idea that could qualify for funding. “After that, we’ll invite you to propose your ideas, and we’ll look for the ones that have the most potential to address truly pressing needs. Then, we’ll select 35 of what we’re calling Champion Cities, and we’ll provide each of them with grants of up to $100,000 to begin testing and refining their ideas. Next year, we’ll award a total of $9 million to help these cities and implement the five most promising ideas. “I hope all of you will participate. It’s a chance to do something big not only for your city, but for the whole nation. And don’t worry, no idea is too outlandish. Well, some might be. Mayor Levine mentioned the idea of changing the name of Miami Beach to Mayor Levine Beach, but that might be a bit much. “The American Cities Initiative will also offer more opportunities for all of you to participate in a new international leadership training program we are launching next month in partnership with Harvard. It’s called the Bloomberg-Harvard City Leadership Initiative, and it’s tailored to help mayors around the world learn from another and from experts in both government and business. “But the truth is, in the private sector, when someone is hired as a chief executive, he or she is often given training in leadership development. Mayors don’t get that kind of support, even though they often run far more complex enterprises. “We’re going to start changing that, by bringing together some of the best minds in both government and business, along with our own network of experts and practitioners. The mayors and their senior teams who participate in the program will receive support throughout the year from world-class experts on management and operations. The program will have a global focus. But because of the urgency of the challenges here in America, we have decided to reserve more of the program’s seats for U.S. mayors. In three weeks, we’ll bring 30 U.S. mayors to New York City to launch the program. Most are mayors who we’ve been working with through our existing programs. Next year, there will be an open application process, and I hope many of you will apply. “The American Cities Initiative will also help you raise your profiles, so that more Americans hear from more mayors, rather than just people in Washington. Too often, discussion of national issues focuses on Washington – where very little is happening – instead of on cities – where big things are taking place. “That won’t change unless more mayors speak up on television and other national media platforms. So we’re going to help more of you do that, through a $600,000 grant to the U.S. Conference of Mayors, which will hire an outside media firm to help put more of you in the news. “We’ll expand our pro bono consulting services to five more U.S. cities. Our consulting team is made up of superstars from my administration, and they provide in-depth support to a select number of cities. They’ve worked closely with mayors around the globe – and we’re excited for them to do even more here at home. “Mayors in both parties understand that the same steps that protect the planet also bring immediate public health and economic benefits, because people want to live in cities with clean air – and where people want to live, businesses want to invest. “Today, cities are communicating and collaborating more than ever, and as they do, effective solutions are spreading across the country and around the world. This community of cities – bound together by pragmatism rather than party – is driving progress on the big issues facing our country. Cities’ strength can serve as a counterweight to Washington’s weakness. And together, all of you really can help lead our country forward.